It’s official: I’m in heaven. This is the perfect island home, and I don’t ever want to leave! Flying over coral islands strung like pearls on a necklace, and sandbanks that sparkle in the sunlight, I knew we were in for a treat long before we arrived. By the time we stepped onto the jetty to a phalanx of staff welcoming us to our ‘island home’, I was head over heels in love. 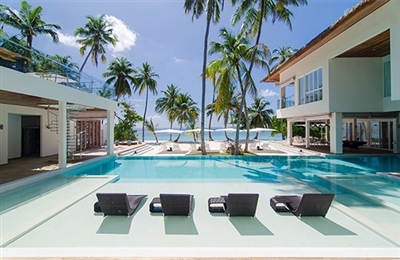 The Amilla Beach Villa Residences really are very special – an ultra-luxe destination with a relaxing island vibe and a bountiful heart-and-soul spirit. Of the eight villas within this elite gated community, the six-bedroom Amilla Villa Estate was my favourite. There are simply no words or pictures to do The Amilla Villa Estate justice. Absolutely everything was beyond-high-expectation perfect – the contemporary Asia-style architecture, the clean lines of the light-filled interiors, the oh-so-perfect pool, the amazing amount of privacy and space. The moment we arrived we kicked off our shoes and slipped into the island groove: swaying in the hammock, sunbathing on the cool pool loungers, diving into the silken lagoon waters mask-and-snorkel at the ready. Indoors, we indulged in the many treats that arrived as if by magic throughout the day. (Turns out the villa came with its own magician –Munaadh, our hugely engaging Katheeb (house manager) who enriched our stay immeasurably.) Munaadh proved to be a mind reader, able to anticipate our every whim, and shared his unbridled passion for the island with us. He also organised a fabulous seafood-and-champagne barbecue at home – one of many culinary highlights of our stay. Sauntering along sandy paths through coconut groves, past ancient Banyan trees, we were amazed by the huge choice of activities available across this small island. Sure, you can have the laziest, most relaxing vacation ever – I would gladly have spent my entire time at the sublime Javva Spa alone! But the chance to go dolphin watching, sunrise fishing and swimming with mantas was too tempting. A shout-out to the astonishing array of restaurants at the Amilla Fushi must be made – the amazing culinary experiences and mouthwatering menus were among the many highlights of our trip. Sunset cocktails followed by a fresh-from-the-sea meal at the over-water Feeling Koi restaurant is an absolute must; I admit to piling on the pounds during my stay. Celeb-friendly privacy, acres of entertaining space and the fair-share bedrooms make The Amilla Villa Estate perfect for a gathering of friends. There’s also lots to keep kids entertained beyond the beach and pool – including the resort’s extensive recreational facilities and kids club. It’s easy to lose all sense of time in this paradise. In fact, ‘island time’ really does exist here, as the Amilla visionaries set their clocks two hours ahead of Male so guests can enjoy extra hours of daylight; how’s that for superlative customer service? A sign at the Empire Beach Club claims “Happiness is not a destination, it’s a way of life.” What a perfect epithet for our stay!